Laptops are more powerful, portable, and flexible than ever. From processor speed to battery life, we pick the best laptops for every type of work. Laptops are like an extension of ourselves. Unfortunately, our human brains aren’t capable of simultaneously crunching numbers in a spreadsheet, conferencing with a dozen coworkers in remote locations, and drafting presentations for that next product launch. Until we connect to our smartphones using virtual reality (a scary but not so fantastical thought), we need laptops as our business companions. 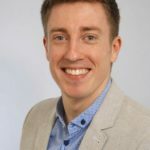 But with the thousands of laptop models available, how do you find the right one for your business needs? We researched some of the top brands and models and talked to IT experts and other business owners to give you a head start on the process. Spoiler alert: the right laptop is one that fits your most likely business-use case. We’ve chosen our favorite three laptops in five use categories below. If you’re like many solopreneurs or small office/home office (SOHO) workers, you spend your day mixing professional and private spaces and tools. Perhaps your living room doubles as a workstation. Or maybe you use the same laptop for holding business conference calls and scheduling your kids’ soccer practice. With blurred lines between home life and work, you need devices that work well no matter the setting. The best laptops for both business and personal use are fast, powerful, and portable—and have enough battery life to get you through your morning presentation and your evening meal planning. Although the three laptops we recommend have somewhat lofty price tags, each one meets the high standards you’ll need to move seamlessly between running your business to handling your busy life schedule. 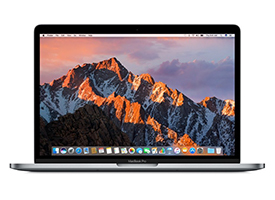 The MacBook Pro is a high-performance, beautifully designed laptop that can take on the needs of business by day and personal life by night (or vice versa). We recommend the 13-inch model for its portability and lower price tag compared to the 15-inch version. Other pros include a stellar, high-resolution display and healthy battery life. The downsides are its high starting cost, near impossibility to upgrade or replace parts, and lack of peripheral connections other than a headphone jack and two USB type-C ports. We’re using the latest MacBook Pro. [The] MacBook Pro 13″ is easy to transport and take to client meetings . . . We are more than happy with the Apple devices we use. They are fast, intuitive to use, and have a great battery life. 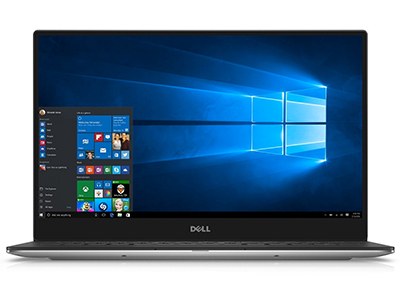 For a massively powerful Windows-based device that’s flexible enough for just about any use case, consider the Dell XPS 9360. It boasts a superiorly fast processor and strong battery, plus a display with near 4k resolution and a wide range of ports. Things to be wary of with the Dell XPS 9360: its expensive price tag; odd, bottom-left webcam placement; and reportedly awkward keyboard. I work on the run rather often. The only spec that matters to me is the screen, [which includes] resolution, size, color accuracy and brightness . . . [My] laptop is a Dell XPS 13 (2015 model), [which I bought] for portability [and the] high-resolution touchscreen, and it was meant to showcase my portfolio during client meetings. 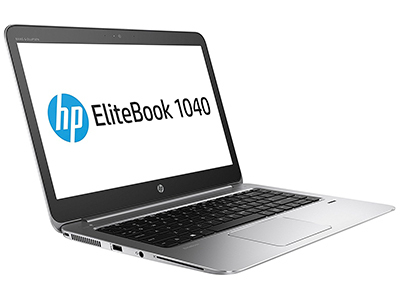 The HP Elitebook Folio 1040 G3 is another high-performing Windows laptop that is excellent for the privacy- and security-minded professional. You get integrated protection from an internationally standardized Trusted Platform Module (TPM) cryptosecurity and a privacy screen that prevents side-angle onlookers from seeing your data. However, it’s heavy and about as expensive as the 13-inch MacBook Pro. And the security advantage of the privacy screen comes with a mediocre resolution. Running a business often requires just that—running from place to place. Today’s always connected economy means that it’s ordinary to work while commuting. But since you can’t feasibly stuff a desktop computer in your suitcase (I mean, you could try, but you’ll raise some eyebrows), you need a laptop that can travel with you. Frequent travelers require more than just a powerful notebook computer. They need a durable device that will last the long haul on commutes, whether by car, train, or airplane. Can’t decide on the right type of computer? We’ll help you decide whether a laptop or a desktop computer is right for your team. Our picks for best travel laptops range widely in price, but each comes with batteries that last longer than 10 hours. (With the ThinkPad T480, you can purchase an upgraded battery with a reported daily lifespan of more than 17 hours!) Long-lasting batteries are super helpful if you need to move from working in an airport terminal to the plane—especially if you can’t find an open charging station. You can quickly move these versatile laptops from work bag to tray table. Their high processing speeds and RAM caching means that you won’t spend too much time waiting for your device to load in between sessions. Just open and get to work. 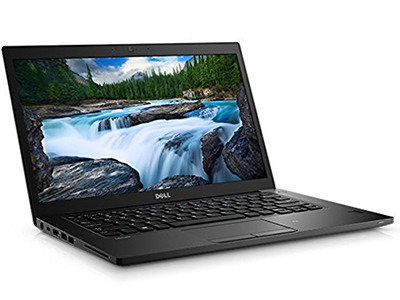 Traveling workers will love the three-cell, 42-watt-hour battery on the Dell Latitude 7480 that can give you more than 13 hours of use on a single charge. And its dual-core, 2.6 GHz Intel i5 processor means you can work fast on the go too. Plus it comes with Windows Pro and a three-year manufacturer warranty (most offer only one year). On the other hand, $1,600 is a bit pricey for a travel laptop, and the Latitude isn’t quite as powerful as some competitors, like the Lenovo ThinkPad T480. 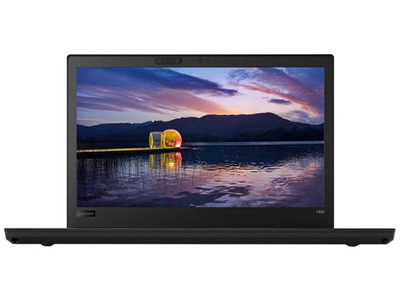 For jaw-dropping battery capability and heavy-duty performance in a travel laptop, pick up the Lenovo ThinkPad T480. 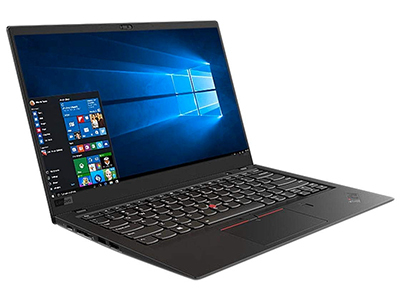 And if you need to go long spans on a single battery charge, add the T480’s upgraded battery with a recorded charge of over 17 hours. You also get Windows Pro TPM and fingerprint security features and a three-year warranty. The most significant downsides: it’s expensive and weighs a luggage-heavy 3.6 pounds. Microsoft likes to market its Surface devices as Apple iPad competitors, but we think they’re best suited as travel laptops. The Surface Pro 4 has an affordable price tag, high-resolution display, and hefty 128GB solid-state storage. Travel-friendly features include a lightweight, convertible design and included stylus and detachable keyboard. It just can’t quite match the processing power of the other travel laptops on our list. [We purchase] 4G LTE enabled Microsoft Surface tablets as daily devices. The hybrid design allows our agents to bring their device with them on every showing and every client meeting. 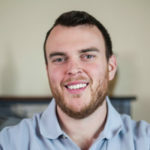 This allows them to always have answers for their clients and provides the perfect platform from which to give listing presentations to potential clients. It makes them appear organized, professional, and always available. The tablet renaissance, led by Apple’s iPad, created an immensely popular and portable way to use computing devices on the go without resorting to traditional, often clunky laptops. Still, tablets can limit your ability to perform specific functions. Most lack a physical keyboard and are difficult to hold for extended periods. The 2-in-1 laptop, which can convert between tablet and laptop, is a fast-growing niche filling the space between the two. Because 2-in-1 laptops exist in the space between laptop and tablet, they need to function well in several areas. They should have considerable processing power, superior portability, and top-shelf displays. All these features should come packaged under a price tag that won’t break the bank. Microsoft Surface Pro 4, one of our “best for travel” picks, is a popular and worthwhile choice in this hybrid category. However, we found three more excellent 2-in-1 business laptops that give you the flexibility and high performance to tackle just about any task. 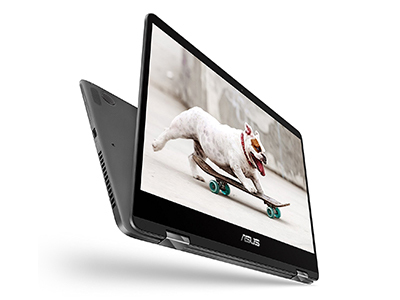 Aptly named for its ability to flip from laptop to tablet mode, the ASUS ZenBook Flip is a solid 2-in-1 choice. Despite being a bit heavy and moderately powered, the computer features a sleek, MacBook-ish design and a glossy, high-resolution screen. It comes with a stylus, a Bang & Olufsen audio system, and fingerprint and face-scanning security technology. Peripherals can connect to two Thunderbolt 3 ports, one USB-c port, or one USB-A port. 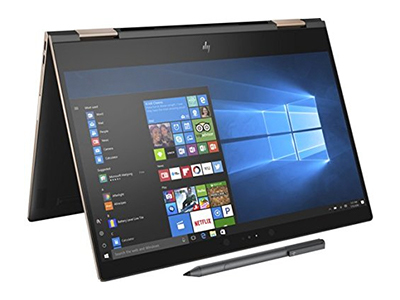 The HP Spectre x360 is our most powerful (and most expensive) 2-in-1 laptop recommendation. It runs on an 8th generation Intel Core i7 processor with 16GB DDR RAM for smooth operations. And 8MB of caching means the device should have no trouble resuming work between uses. What’s more, the Spectre features an ultra-HD display capable of 3840 x 2160 resolution—truly stunning to behold. 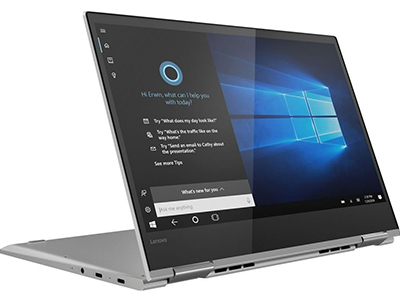 For a flexible and affordable computing experience, check out the Lenovo Yoga 730. Its streamlined and lightweight design pairs with a fast Core i5 processor, 8GB memory, and 256GB storage. The battery charges quickly but stretches only just beyond 10 hours. And despite the display’s high resolution, we’ve read several reports of dimly saturated colors. Still, the Yoga is worth meditating on as a worthy 2-in-1 companion. Top-of-the-line, supremely powerful, and meticulously designed laptops have their place. But not every office or work function demands a Cadillac. You can do email checking, web browsing, and basic word processing on bare-bones machines that give you just the essentials in computing power. Consider one of these budget laptops for quick and dirty business tasks. While you can find devices under $200, you get what you pay for. If you’re investing in a laptop, cheap price tags often mean weak and flimsy equipment. You’ll want a machine with at least 1.6 GHz in processing speed, 4GB of memory, and 32GB of storage. Also, avoid traditional hard disk drives. A solid-state drive (SSD) or eMMC flash drive is best—thanks to the lack of moving parts, they give you faster, snappier functioning with less risk of failure. None of these three budget laptops below should blow up your budget, which means you can buy a few and replace them every couple of years as needed. The most expensive model on our “best for the budget” list, the ASUS VivoBook packs an impressive punch into an affordable package. This Windows machine is powered by a speedy 3.4 GHz Intel Core i5 processor and comes with a massive 1TB (1,000GB) solid-state hard drive. Your eyes will love the 15.6-inch, low-bezel display with a 1920 x 1080 resolution too. What’s not to like? Well, the VivoBook is bulky at 3.7 pounds and has an unspectacular battery life at only five hours. 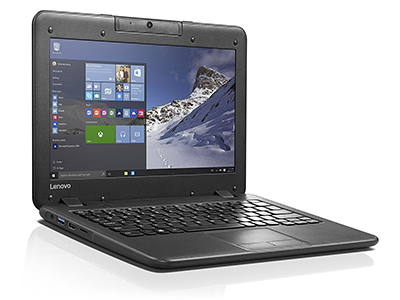 If you need a super cheap but solidly powerful device for essential office work, we like the Lenovo N22. It isn’t flashy, high-powered, or particularly graceful, but it is light and fast enough for standard business functions like Word processing, web browsing, and email management. As a bonus, the N22 includes a touchscreen display (although it’s not a true 2-in-1 because it can’t convert to a tablet). 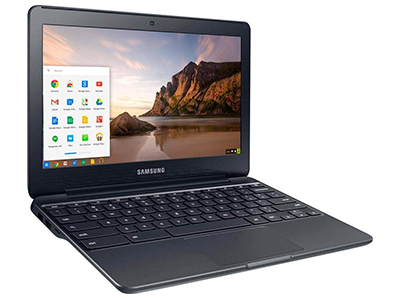 Our last budget-bin pick is the Samsung Chromebook with Intel N3060. 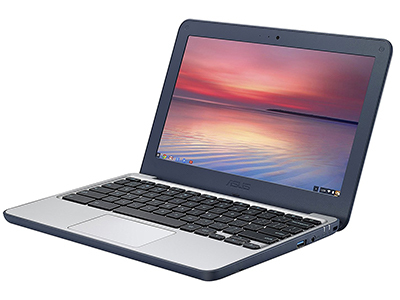 Chromebooks are known for their compact design and snappy, user-friendly Google Chrome operating system, and this model fits the bill. The Chromebook 3 has a durable, lightweight design and an 11.6-inch display. It has only 32GB of internal storage, but you can use the Micro SD slot to upgrade to 100GB or more. 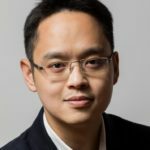 If your business requires you to compute where there’s risk of extreme temperatures, dust, or moisture, don’t risk taking a standard laptop. Although SSDs, flash memory, and advanced materials have made laptops more durable than ever, most can’t endure too many outdoor conditions. That’s where rugged laptops come in. From rubberized form factors to spill-resistant keyboards, these formidable devices can weather just about any storm. Durability is king when choosing a rugged laptop. Look for factors such as resistance to shock, drops, and vibrations. Plus, it should be designed to keep out dust, water, and anything else that could interfere with its electronic innards. Rugged laptops should also hold up under both super hot and cold temps. Depending on how you’ll use it, you may need to consider a laptop that’s both durable and powerful. Our three picks are rugged enough to take a beating, and they demonstrate high performance too. 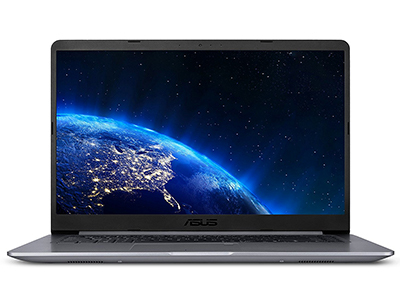 The ASUS Chromebook C202SA-YS02 isn’t the most heavy-duty laptop available, but its “ruggedized” and water-resistant features matched with a super-low price tag make it worth a spot in the category. The C202SA-YSO2 is only 2.2 pounds and 0.9 inches thick at its largest, so you can toss it in just about any work bag. And as a Chromebook, it’s fast and easy to use. Just don’t expect it to be as fast or sturdy as some of the other two machines we picked. 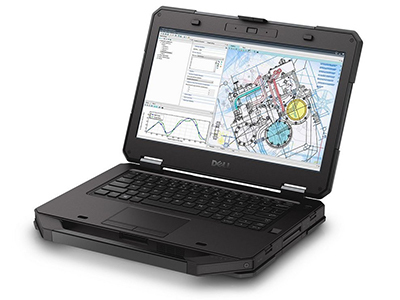 It’s right in the name: this laptop is rugged and for good reason—the Dell Latitude 14 Rugged can take a beating. It features an impressive 14-inch screen and full-size keyboard, protected by a durable shell that resists drops, electric shock, extreme temperatures, and vibration. The base model is quite pricey and heavy at over $1,600 and 6.3 pounds, but it has enough power to compete against popular laptop series like the MacBook Pro and HP Elitebook. If you’re willing to pay a steep $1,700 or higher price, you can get an immensely high-performance laptop with a durable, long-lasting, and lightweight design. The Lenovo X1 Carbon features carbon fiber materials that make it highly portable and hard to damage. That excellent durability is matched by superior performance thanks to 7th generation Intel Core i7 processors, 16GB memory, and 1TB storage. This machine isn’t priced for every budget, but it’s worth the investment for those who can afford it. How often should your business replace your laptops? Like choosing between high-speed internet providers, selecting a laptop for work can be a daunting task. Spending upward of $2,000 on a single laptop—especially if you need to purchase multiple—is tough for businesses with thin margins. But in many cases, buying pricier equipment pays off because you don’t have to replace them as often. Budget laptops may cost only a couple hundred bucks, but you can expect to replace them about every two to three years. Heavy-duty laptops are built to last, which means you should be able to count on them for five or more years. Ultimately, it comes down to what you need the laptop to do for you or your workers. If budget laptops work for you, buy a bunch and replace them often. But if you need the power and performance that high-end devices provide, invest for the future. Clean up your cache: A laptop’s memory, or RAM, is like the part of your brain that’s focused on short-term recollection and task management. Over time, RAM can get bogged down by processor-demanding programs, slowing the entire computer down. One way to free up RAM is to check your laptop’s Task Manager (Windows) or Activity Monitor (Mac) and search for memory hogging applications. Close the ones you’re not using, and consider deleting apps you don’t need. Protect your investment: You may take care to avoid dropping or spilling on your laptop, but what about when it’s in your bag or backpack? Even when stowed away, your laptop is at risk of stress and breakdowns. If you don’t have a super durable rugged laptop like those we recommend above, consider buying a sleeve or case to safeguard the computer wherever it is. Conserve your battery life: Many of the most sophisticated laptop models still drain batteries quickly. You can take some steps to avoid a sudden shutdown, like turning off Wi-Fi and Bluetooth connections and dimming your display brightness. Also, if you’re not using the device, close the lid. As long as you have enough RAM cache, you should be able to wake it back up and get to work quickly. The right laptop for your small business is the one that gets the job done at a price your budget can withstand. Consider how you’ll use it most—while traveling or for a combination of personal and business use, for example—then pick one with the right mix of power, durability, and cost. If you love a laptop that we didn’t include above, let us know! Leave a review in the comments below to help us improve our recommendations.